Editor’s note: After this story was published in the print edition of NEWS On the Green, State Farm issued a statement, the text of which is published at the end of this post, and the Brookfield trustees added to the agenda for their meeting at 2:30 p.m. April 11 to discuss awarding a contract to clean up the property. 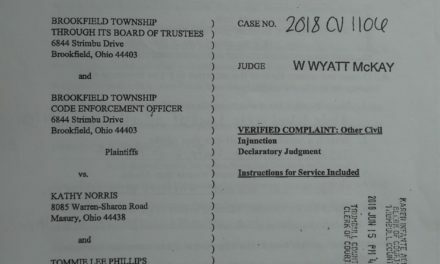 Brookfield Trustee Dan Suttles has filed a complaint with the Ohio Department of Insurance, alleging State Farm should have placed money in escrow with the township that would have been used to raze a fire-damaged mobile home at 830 Boyd St. The mobile home burned July 6, 2017, and owner Dawn Ross was unable to move back in. 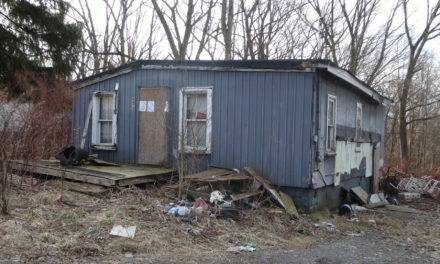 The township in April 2017 posted the mobile home for alleged property maintenance violations and ordered its removal along with the removal of an above-ground pool also on the property. 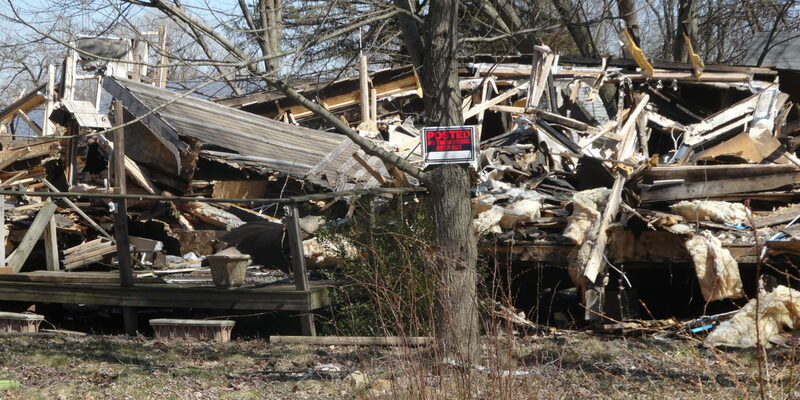 Ross has had the mobile home collapsed, but the building materials are “smushed … into a pile,” as Suttles called it. Neighbors frequently have questioned trustees about what will be done with the debris. 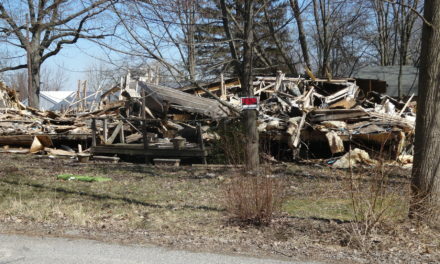 Janet Wedge asked at the March 4 trustees meeting, calling the property an eyesore. “We’re getting tired, up there, looking at that mess,” Wedge said. Township officials said state law requires insurance companies to place money in escrow based on a formula outlined in the law. Suttles said the amount of money should have been about $6,000. Suttles said he has talked with State Farm and learned that money was not placed in escrow because State Farm does not recognize Masury as part of Brookfield Township, although township Fiscal Officer Dena McMullin said State Farm placed money in escrow after a 2017 fire on Judson Road in Masury. “I was a little frustrated. I said to the guy, ‘Isn’t that insurance fraud? This person received the money,’ and he goes, ‘We pay the insured, and they are supposed to take care of it,’” Suttles said at a March 25 trustees’ meeting. Trustees allege that State Farm violated the law, and Ross “walked away with the money,” as Trustee Ron Haun put it. “When you read the Ohio Revised Code, it is the insurance company’s responsibility to research and escrow that money,” said Fire Chief David Masirovits. Attempts to reach a State Farm representative and Ross were not successful. The complaint, dated March 22, asks for a payment equal to the escrow amount to be used for demolition. Suttles said officials have received two quotes to remove the debris, $2,500 and $3,800. “We shouldn’t have to pay to remove that structure and then put it on their taxes, because they’re not paying their taxes,” Suttles said. According to the Trumbull County Auditor’s web site, property taxes have not been paid since March 2017.